I’ve finished Eva’s socks. I don’t have pictures, yet. I know I should, but somehow haven’t gotten around to it. I finished them Saturday afternoon, and they look pretty good…until they actually get worn much. The problem is one I foresaw, but sort of ignored. They slouch. They don’t stay up adequately well. I know why this is (the spiral pattern of ribbing doesn’t provide the stretchiness that vertical ribbing does), but I’m still somewhat frustrated by it. I’m wondering if it’s too late to add some elastic (I rather suspect it is). Eva says she likes them as slouch socks, but I’m not as satisfied with them as I’d like to be. So it goes. There will be more socks moving forward. In fact, I’ve just started another sock (this one for me). It’s the second sock of a pair I started back before I started Eva’s. It’s a very similar pattern, but with far more ribbing at the top, and less of the swirling pattern up the leg. We’ll see if that helps it stay up better. This is the first time I’ve been disappointed with how a big project turned out. I’m not deeply upset by it, but I am aware of a number of things I would do differently if I were doing it over. I’m not going to rip back and re-do it…in large part because the socks took so long to do the first time, I can’t quite face spending that much more time with them again. Instead, I’m trying to focus on this as a learning experience. As disappointments go, this one is fairly minor. It’s something that if it mattered enough to me, I could fix (I think). What this means, among other things, is that I am now done with one project, and down to 3 active projects on the needles. One of these (a bedspread) is my “in front of the TV” project, and getting some attention. Another, a shawl, is largely languishing at the moment, but I’ll come back to it. 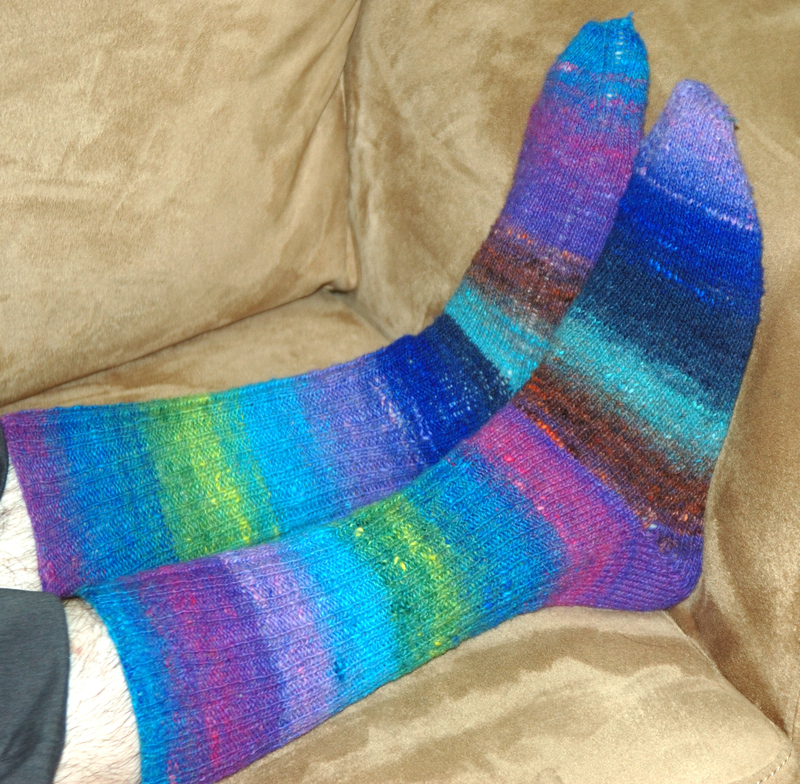 Regardless of how I feel about how the socks came out, it feels really good to have finished something. 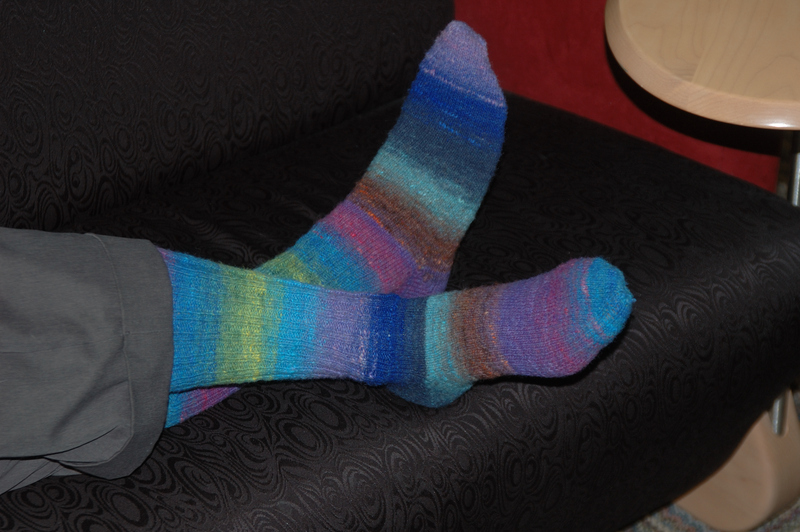 Eva’s socks are the first project I’ve finished since January, which, for me, is a really long time. Just finishing them is an accomplishment, and I’m feeling good about moving forward again. That is the sock in its current state. It has ribbing on the foot, which is being put into motion (swirling) around the calf. In the photo below you can better see the transition from the ribbing on the foot to the swirl on the calf. You can see the swirl better than the ribbing. 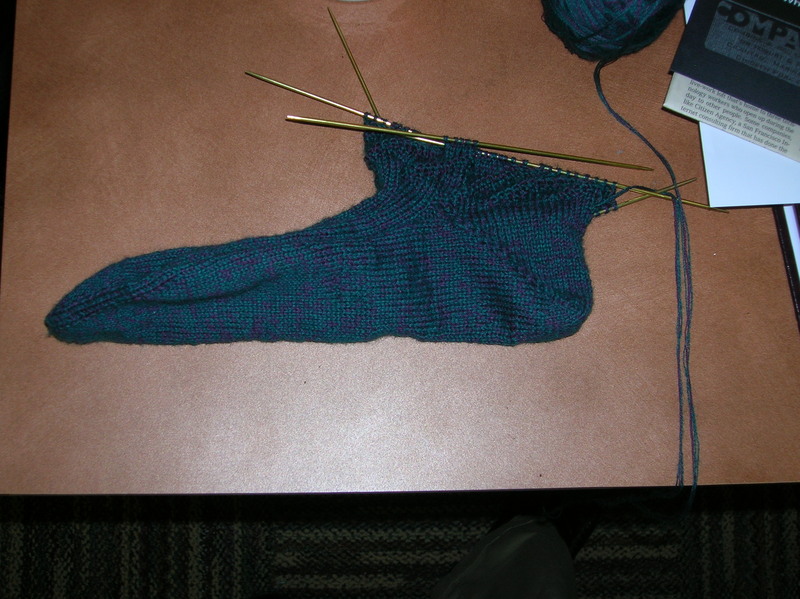 The really exciting thing about this is that I feel like I’ve finally made some real progress on this sock. Today I (more or less) had a day off. Admittedly, I wound up doing far more than I intended, but it was mainly fun (the standing around overwhelmed in the grocery store? less fun). 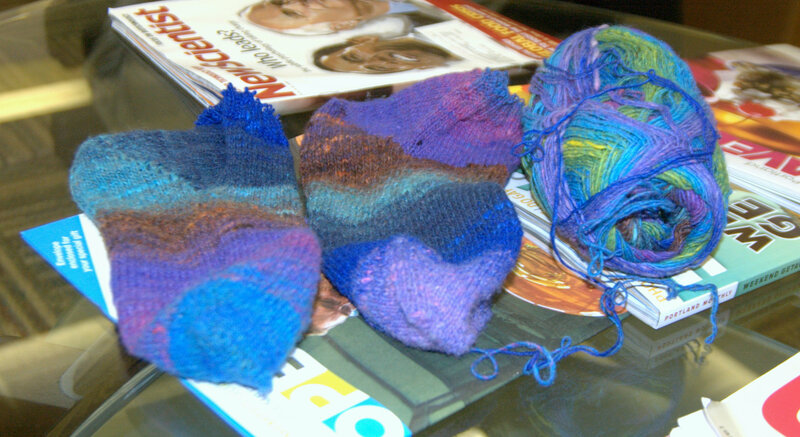 In between, I’ve been working on Eva’s socks, and specifically working on turning the short row heel. You know, a few rows at the pharmacy while the pharmacist clears up why the insurance company paid three dollars towards the prescription I was picking up. . .for my cat (it was a mistake and I paid the extra $3, which I suspected I would have to once I pointed it out to him). A few rows while Mycroft had her yarn put on the cone at Yarnia. A few more rows at some other store, I think. 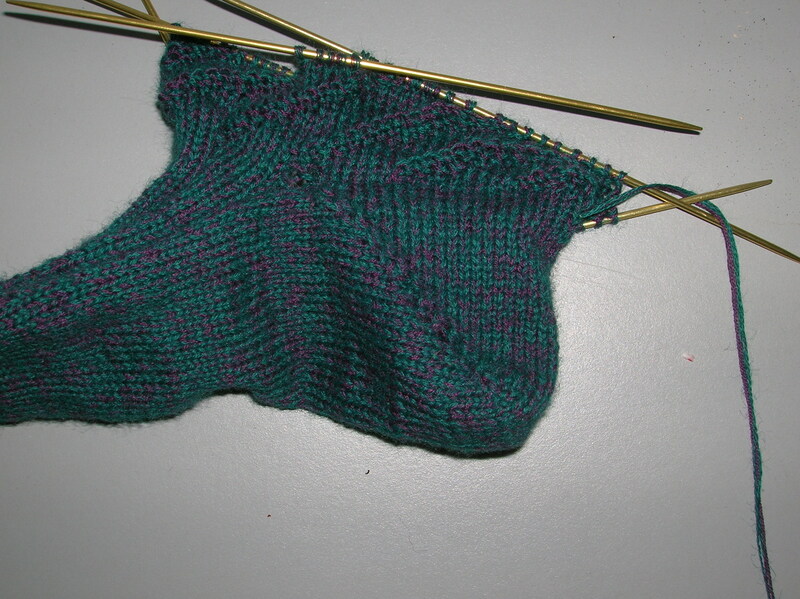 Turning a short row heel is sort of interesting. I’m following the instructions in this pattern, and find it relatively easy, but a little disorienting. The odd part about short row heels is that you find yourself knitting fewer and fewer stitches each time back and forth. And as opposed to most ways of doing decreases or increases, where you wait a row between reductions, these happen fast. It sort of reminds me of the end of a game of pong, where the ball is moving faster and faster between the two ends of the screen. Like most things, however, the short rows are about to start expanding again, and I’m going to have to strive to keep gaps from forming. I have yet to knit a pair of socks without gaps around the gusset type thingy. We’ll see if this goes better. I think the trick has something to do with learning to pick up the “wrapper along with the stitch”, whatever that means. I think I did it wrong last time, so I suspect I will ask some advice from the knitting mavens at CubeSpace. Speaking of whom, Emily had her pattern published in the new edition of Knitty out today. Yay Emily! Check out her big family tree knitting design project here. I am beginning to be recovered from last weekend. I feel significantly more functional than I had been, which is good because tomorrow begins another full weekend. This time, a bar mitzvah Friday night and Saturday, followed by religious school and adult education on Sunday. But it’s not nearly as draining as it was. Things are adequately back to normal that I’ve had some time to do some knitting. My primary project at the moment is working on Eva’s socks, which are good, but a little bit fussy. I’m working from the toe up, and the top of the foot as a k6p3 ribbing pattern that I’m going to turn into a spiral once I hit the leg. At this point I’m about half way up the foot or a little more. These socks have taken a while because I had to rip them out the first time once I was about 3″ in because I didn’t like the fabric: it was a bit too tight, and thought it might stand up on its own without a foot in it. That seemed bad. So I upped my needle size from 00 to 0, and I like this fabric much better. This pattern is basically my own, and once I have it a bit better established, I will probably go ahead and post it (assuming I like it once it’s done). In other news, I’m distinctly pleased to be feeling human again, to have a little bit of time for knitting again, and to have the brain power to be knitting something other than straight stockinette. I’m even back to using polysyllabic words.